Last week we went in for our first ultrasound at my new ob/gyn, Dr. G's office. I always get nervous the night before an appointment. I worry that something will be wrong. My worries were unfounded though. The babies were doing great. They were measuring perfectly at 9 1/2 weeks. Baby 1's heartbeat was 168 and Baby 2's heartbeat was 177. Baby 2 even wiggled a little bit on the ultrasound. Everything looked great. It is so amazing seeing my little miracles. They look like little gummy bears. 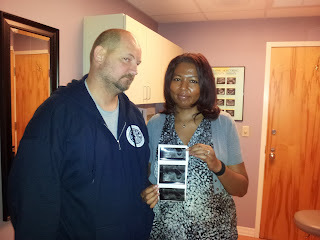 It will be so hard having to wait until the next ultrasound. I did have a bit of a scare on Thursday night. I noticed a little bit of spotting as I was leaving work. The first thing I did was call the Dr. G's answering service. The on call nurse called me back in less than 5 minutes and she knew right away that I was pregnant with twins through IVF. I was very impressed. She didn't think it was anything to worry about but told me to go home and rest for the rest of the night and the next day. and to drink two bottles of water. I followed her instructions exactly and haven't had any other problems. I was very impressed when they called the next day to check on me. Still praying for sticky babies and a healthy full term pregnancy.